Our examination of Aphria led to another Aphria-backed company, Liberty Health Sciences, where we uncovered multiple irregularities that raise more questions around believed undisclosed insider self-dealing. Liberty acquired a Florida property this year. Rather than just buying the assets, they were acquired through a newly-formed entity, netting the shell holders an estimated ~C$5 million gain in 6 days. Holders of the shell included key Aphria, Scythian, and Liberty deal partner/insider Andy DeFrancesco, along with 3 individuals alleged by the SEC to have run multiple pump & dump schemes. Unnamed individuals bought 242 million shares of Liberty in a highly dilutive $0.001 private placement mere days after Aphria announced its intention to purchase its shares at 208x the price. Based on Canadian Securities Exchange records we believe Aphria/Liberty Chairman Vic Neufeld participated in this discount round, along with Andy DeFrancesco. As stated in our last report, we are of the strong opinion that Aphria shareholders’ equity has been diverted into acquisitions that were egregiously overpriced, and that Aphria insiders were likely undisclosed beneficiaries. We focused primarily on the company’s recent LatAm transactions and identified multiple red flags of believed undisclosed related-party transactions. We noted that key Aphria/Scythian deal partner/insider Andy DeFrancesco was an undisclosed backer of that slew of deals. DeFrancesco effected the transactions in conjunction with Aphria Chairman & CEO Vic Neufeld, who had served as Chairman of Scythian at the time the deals were originally announced and was Chairman & CEO of Aphria when the transactions ultimately closed. We realize we could stop the Aphria story at this point, having given readers a good sense of what went on at Aphria and Scythian (now known as Sol Global Investments). We don’t intend to do that, however. There is much more to tell. Aphria’s relationship with Scythian BioSciences is not the only one that raised questions during our research. Liberty Health Sciences (CSE:LHS) is another cannabis company that was taken public via reverse merger with Aphria’s backing. As part of the deal, Vic Neufeld was appointed director and Chairman of Liberty, a role he continues to hold to this day. As noted in our previous piece, Andy DeFrancesco was the believed architect of an elaborate shell structure that culminated in Aphria’s C$280 million LatAm acquisitions. DeFrancesco was also the self-described architect of the Nuuvera transaction, which we also determined to be largely worthless and in which insiders eventually admitted to having held undisclosed stakes. DeFrancesco was publicly described by Liberty Health Sciences as the founder of the DeFrancesco had set up the entity that ultimately became Liberty. Michael Galloro, the COO of Delavaco Capital (the personal private equity firm of DeFrancesco) was CEO of SecureCom Mobile, an entity that was subsumed in the reverse merger with Liberty Health Sciences. Galloro also served as the interim CEO of Liberty Health Sciences and currently serves as a director at Liberty. Delavaco has been listed as a “special advisor” to the company in connection with its secondary offerings. Normally, when companies acquire a piece of property, they just go out and buy it. In what readers of our last report may consider a now familiar pattern, Liberty took a rather odd approach to their purchase. On January 4, 2018, Liberty Health Sciences announced a binding term sheet to acquire a privately held Canadian entity called 242 Cannabis, Ltd. (“242 Cannabis”). The entity had a wholly owned Florida-based subsidiary with a similar name, which in turn had an agreement to purchase a parcel of Florida land and greenhouses. In other words, Liberty appears to have agreed to acquire a “privately-held” entity that itself hadn’t yet purchased a piece of property. “As 242 Cannabis did not have any operations, this acquisition was accounted for as an asset acquisition, with $13,492,572 allocated to land and greenhouse infrastructure” (audit pg. 17). Florida real estate records show that the private shell entities had acquired the property for only US$6.5 million (C$8.5 million) on February 9, 2018. The private entity, therefore, closed its own purchase 6 days before the Liberty deal closed, on February 15, 2018 (audit pg. 21). So, which investors made ~C$5 million in 6 days? 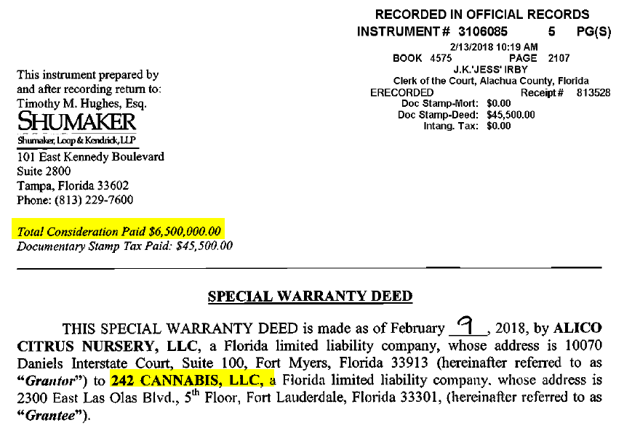 Canadian and Florida corporate records show that the 242 Cannabis shell entities were brand new entities registered to the spouse of none other than Andy DeFrancesco. Five entities in the name of Andrew DeFrancesco’s spouse and kids, including 4 newly-formed Bahamian entities. Three individuals recently charged with fraud by the SEC for allegedly running multiple pump and dump schemes: Barry Honig, John Stetson, and Mark Groussman. Yet again, this transaction took place under the oversight of Vic Neufeld as Chairman of Liberty. We urge readers to note the parallels between this transaction and those of the LatAm transactions described in our previous report, which similarly involved Neufeld & DeFrancesco, intermediary shell entities placed between acquisitions, and presumed quick profits for the holders of those shell entities at the direct expense of public shareholders. Did Aphria Chairman/CEO Vic Neufeld Invest Ahead of Aphria’s Own Investment into Liberty Health Sciences…at a 99.5% Discount? Liberty Health Sciences became a public company via a reverse merger in April 2017, with Aphria’s backing. As noted in the press release announcing the transaction, Aphria agreed to purchase over 120 million common shares of the entity for $25 million, or $0.208 per share. Documents describing the lead up to the transaction show a worrying sequence of events. The press release announcing Aphria’s investment at $.208 was made on April 4, 2017. Why would Aphria – which announced its foundational transaction to purchase $25 million worth of Liberty shares at $0.208 per share – allow a separate, highly dilutive purchase to occur at such a massive discount only days later? Based on a subsequent filing, it appears that Aphria’s own Chairman & CEO, Vic Neufeld may have participated in the $0.001 share round. A filing with the Canadian Securities Exchange (CSE) details the holders of the later April 27th $0.208 round who invested alongside Aphria at that price. Within that document we also see how many securities were already held by the named holders prior to that point. From this we can infer the number of securities likely purchased in the $0.001 round. Did Aphria Chairman/CEO Vic Neufeld invest in Liberty at a steep discount, weeks ahead of Aphria, thereby diluting and undermining the interests of his own company in order to personally benefit? We emailed Neufeld and asked if he had invested in the $0.001 round of Liberty ahead of Aphria. We have not heard back as of this writing but will certainly update this if we do. When reviewing the document further we see several more anomalies. Along with Vic Neufeld, multiple entities associated with Andy DeFrancesco and his spouse also look to have held significant stakes in Liberty prior to the April 27th round. In addition to DeFrancesco, we also see that Barry Honig had a large stake prior to the April 27th round through his firm GRQ Consultants, an acronym that multiple sources informed us stands for “Get Rich Quick” Consultants. Barry Honig was recently alleged by SEC prosecutors to have run multiple pump and dump schemes. We believe Aphria’s public shareholders deserve to know the complete list of beneficiaries of this $0.001 round, which had significantly diluted their stakes just weeks ahead of the Aphria investment. As short-biased investors, people often apply a level of skepticism and scrutiny to our work based on an understanding of our incentives. That’s totally fair and we welcome it. A lively, well-informed debate makes for a vibrant market and ultimately benefits everyone. Often lost in that debate is the role of sell-side research and where the incentives of bankers are pointed. Following our report on Aphria’s LatAm acquisition, several banks either voiced meaningful reservations or placed Aphria’s ratings under review in order to take time to assess our research. We noticed, however, that one bank stood rather starkly at odds with the others. They reiterated their buy rating, with a target price implying a 350% return from current levels. We were pleased to see this, largely because we were in the process of writing about Clarus’s unusually close relationship with Aphria and Andy DeFrancesco. 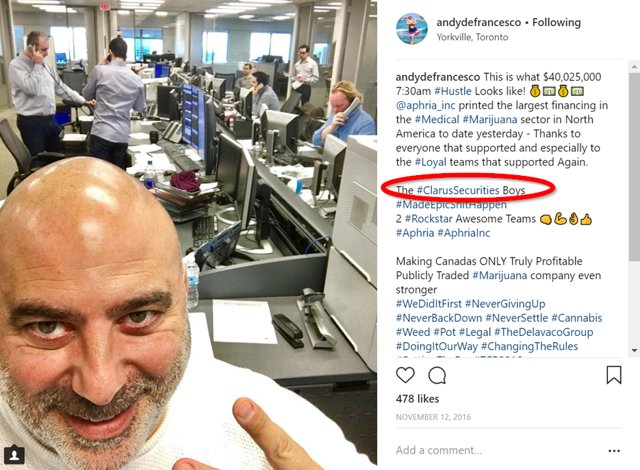 Once again, turning to DeFrancesco’s private Instagram account (I highly recommend him as a follow), we see what appears to be DeFrancesco in the Clarus offices raising money on behalf of Aphria. It is unclear whether the bank’s Head of Research or executives have participated in other Aphria-backed private placements given the limited disclosure around many of those filings. Clarus has led Aphria’s numerous secondary offerings (1,2,3,4,5,6,7). 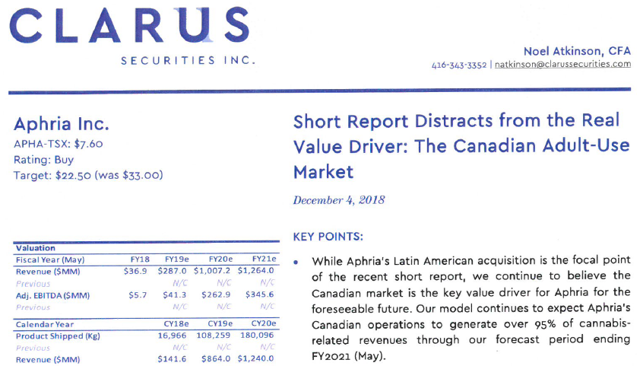 Clarus provided the fairness opinionfor the sale of Scythian’s LatAm assets to Aphria. Clarus was the investment bank that led the foundational private placementoffering with Liberty. Clarus led the secondary offeringfor Nuuvera, and then later advised Aphriaon acquiring Nuuvera. Clarus’s research department has consistently held a buy rating on Aphria. As stated above, we think it is important to fully understand where incentives point when assessing potential bias. Following our earlier March exposé on Aphria’s irregular acquisition of Nuuvera, Aphria admitted that their CEO, CFO, and six directors had personal stakes in the company that they were acquiring that had not been previously disclosed. We never got an answer. We also asked the company yesterday if Aphria’s executives or family members had participated in the shell deals for the LatAm investments. We haven’t received an answer to that either. Normally that information would be available through Canadian Securities Exchange filings, but the company chose to redact ALL of the names of the shareholders of the LatAm shell entities (1,2). The company has been rather thin with its disclosure, but we can get a glimpse of who may benefit from these private placement deals from the holders we see in the Liberty private placement round mentioned above. Putting aside questions around Liberty’s $.001 giveaway round, holders of the $0.208 private placement who invested alongside Aphria clearly benefited from the involvement of the company. Liberty’s backing by Aphria, considered a major player in the space, gave the fledgling company a great deal of credibility. Those who were lucky enough to invest in the round made a quick 100% on their money following Liberty’s public open. So, who participated in this lucrative private round? Without naming names, the spouses and family members of at least 4 Aphria executives/directors also benefited from the Liberty private placement. We think investors deserve full transparency on the holders of ALL of Aphria’s private deals, whether it be relating to Liberty, Aphria, Scythian, or any of the apparently numerous shell entity acquisitions. Much like Scythian, we view Liberty as just another extension of the Aphria web of highly questionable deals. At this point, we think the responsibility is on management to earn back shareholder trust and begin making all the beneficiaries of these shell transactions, discounted private placements, and related deals FULLY TRANSPARENT. We will continue to report on this subject. Note: The only known HoldCo shares issued prior to the Liberty reverse-merger were “issued in connection with and as consideration for entering into the Know-How license.” Aphria obtained all the shares in the “Know-How” placement. Note: The price of shares bought by the $0.208 round holders included a 3 for 1 consolidation, so the resulting price was $0.624. Given Liberty’s opening trading of ~1.30 the resulting gain was approximately 108%. So when are you covering and buying back in? So when are you guys covering and buying back in? Well, is LHSIF, A GOOD INVESTMENT? OR NOT A LEGITIMATE COMPANY? Declaring yourself to be short the stock gives everyone the motivation behind your “research”. By deliberately trying to destroy companies like this one you help to deprive people of the legitimate medical benefits of these products. Good research. Your opinions are supported by the bearish trend…in fact the positive sentiment in marijuana stocks, especially the vastly overvalued Canadian ones, coupled with a complicit Canadian watchdogs is fertile breeding ground for scam companies made in Canada. Thank you. Sort of. I’m glad you have outed Vegas Vic and his crew of pirates. I just think it is sad that it is such a black eye for cannabis and legitimate companies. Cannabis is much more about health than getting high and the bad taste in investor’s mouths caused by Aphria will linger for years. SEC. Please lock up Vegas Vic and many of his pirates for a long time. Give their profits back to shareholders. I tried following Andy DeFrancesco on Instagram, but the shady guy has put his profile on “Private”, and hasn’t accepted my follow for more than 36 hours. 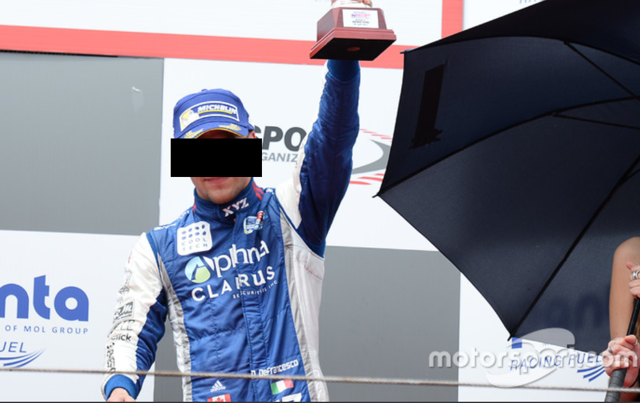 Looks like he has something to hide. Great report! Also, I have seen Clarus put out ridiculous price targets for their other partner companies, and those companies have also tanked significantly. A prime example is, Urthecast. A Vancouver based company who Clarus, in particular Mr. Noel Atkinson (the same research analyst covering Aphria) said had a price target of $3+ only over a year ago. Now, Urthecast is priced at $0.18. I sense either zero ethics or just absolutely terrible at putting out price targets from what I have seen over the last 3 years. Since this is the second company I have seen them have an Investment Banking relationship with and putting out good reports for, I am leaning towards them being extremely unethical here. You waited to come out with this information? Why wouldn’t you disclose all of this at the same time. You’re credibility continues to fall and I’m not even and investor in this company. It is beginning to be very clear what your plan is here for personal profit. – So, to state it clear. These re your opinions and not the fact. The documents attached were not convincing. Anyone can photoshop and fabricate files like that. Hmm. – Who is I or we? The document without names is worth of nothing. You do not dare to sign this with your names? Wht? – Can this be trusted. No serious research institute works without compensation. – you are shorting the equity. This is business relationship. What you claim here is not trueful. and those people who benefit from medical pot. Too bad that when you are sued there will be nothing to recover. Obviously your reporting on this company will be vindicated once the SEC investigates. Great job finding the truth,I m so tired of all the scams and the people in high places taking advantage of the honest people whom dare to believe in the systems today.This is exactly why crypto currencies r on the rise .We the people r tierd of all this corporate greed. Beware of crypto-currencies! Lots of scams there. Good work. You all inspired me to do some digging myself. I started by researching every company listed on the Delavaco Group “Tombstones” tab. Almost all without fail, cease to exist anymore and have the look of “pump & dump.” I encourage anyone interested to look for yourselves. blogroll. I wanted to thank you for this very good read!! Awesome issues here. I am very satisfied to perer your post.